With the dissolution of the Soviet Empire and the end of the Cold War, the international spy novel has suffered from a lack of compelling story lines. Daniel Silva has remedied this deficiency by making Israel as the epicenter of his provocative novels. With a haunting past defined by the Holocaust and a present preoccupied by terrorism, there are storylines aplenty. 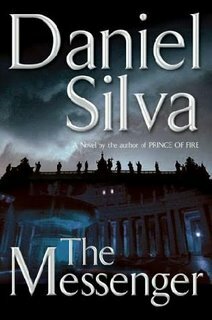 Much of Silva’s phenomenal success is due to his main character Gabriel Allon, a sometime Israeli assassin who is also a world-renowned art restorer. A child of Holocaust survivors, as an art student Allon was tapped to join the Wrath of God team, which sought retribution for the Munich Olympics terrorist plot perpetrated by Black September. Allon is an assassin with a conscience though, who sees his task as necessary but supremely regrettable. He was changed after his first kill, both physically and spiritually, and by each successive one. In The Messenger, Silva’s latest, terrorists are planning a massive attack on the Vatican. Extending the hand of friendship, Israel sends Allon to help protect the life of the pope. After the attack, Allon’s team affects a search for the terrorists who planned and financed the assault on Vatican. Using a once lost Van Gogh and a young American art expert, the Israeli team bates a trap that nearly goes disastrously wrong. Silva's writing is gripping for intellectual sweep. His use of art, history, music, and travel adds layers of depth that are the hallmark of great novels. Most importantly, Silva is not afraid to take on controversial issues. In The Messenger, he probes real life concerns that international Islamic terrorism is succored doctrinally and financially by Saudi Arabia. His very believable scenario might anger some, but it will be a great conversation starter.